JERUSALEM (CNS) – A middle-age woman kneels, large purse and red plastic bag in hand, and places a small collection of religious goods and two vials on a worn pinkish-colored stone slab. She makes the sign of the cross, prays for a moment and bends over to kiss the stone. Mission accomplished, she places the items back in the bag and melts into crowd of pilgrims visiting the Church of the Holy Sepulcher. The limestone stone slab is no ordinary stone. It’s known as the Stone of Unction and marks the site where, tradition holds, Jesus’ body was anointed and wrapped for burial. Daily, hundreds of pilgrims from around the world crowd around the stone praying in a multitude of languages as they seek spiritual inspiration and grace from the risen Christ. This particular Stone of Unction dates to 1810. It replaced the 12th-century slab destroyed in a fire that heavily damaged the church. The Stone of Unction is the first holy relic that visitors to the Church of the Holy Sepulcher see as they walk through the main entrance to the place known as the center of Christianity. Two millennia ago Golgotha, or Calvary as translated into Latin, was a small hill just outside of the walled city of Jerusalem. Today, a massive stone church, rebuilt several times since Constantine ordered its construction in the year 326, encompasses both the place where Jesus was crucified and his tomb hewn out of bedrock about 90 feet away. Once upstairs, pilgrims find two chapels. The first is the Catholic Chapel of the Nailing of the Cross and commemorates the 11th station (Lk. 23:33) of the cross on the Via Dolorosa, the Way of Sorrows. The chapel houses a 12th-century mosaic of Jesus being nailed to the cross on the vault. To the left of the altar is statue of Our Lady of Sorrows, depicting the 13th station: Mary receiving the body of her son after it was removed from the cross. The second chapel, to the left, is the Greek Orthodox Calvary, with its altar directly over the rocky outcropping where Christ is believed to have been crucified. Softer rock was quarried away to make way for the church, leaving the main rock of Golgotha, which can be seen behind glass. Under the altar, the faithful can reach into a cylinder cut through the floor to touch the rock below. Directly below the Catholic chapel on the main floor is the Chapel of Adam, which was built into the bedrock of Calvary. A glass windowpane behind the altar offers a distinct view of the bedrock with its long craggy crack, which is believed to have been caused by an earthquake at the moment of Jesus’ death. The Tomb of Christ, housed in a large boxy shrine, is the holiest site inside the church. Located under the rotunda, the shrine, or edicule, commemorates the place where Christ was buried and his resurrection. This particular shrine was rebuilt in 1809 following the disastrous fire a year earlier. Long lines of pilgrims usually are waiting to enter the shrine’s two small rooms. The first is the Greek Orthodox Chapel of the Angel. It contains a piece of the stone which enclosed Christ’s tomb. A low door opposite the entrance leads to the Chapel of the Holy Sepulcher, a tiny room housing the Tomb of Christ, the 14th station (Lk. 23:50-53). 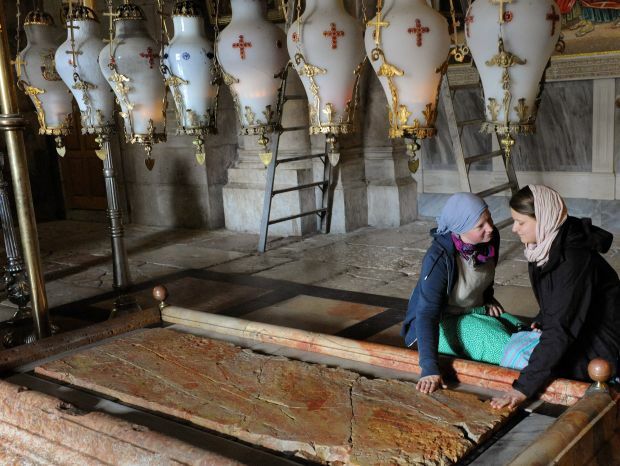 A small marble slab covers the place where Jesus was laid to rest. It was set in place in 1555 when the edicule was rebuilt. Candles mark the place where Jesus’ head rested. The chapel is so small that it can only accommodate eight to 10 people at any one time. The rest of the church offers a conglomeration of chapels and architectural styles that tell the story of its history. Mass, Divine Liturgy, vespers and prayer services take place at various times throughout the day giving visitors a glimpse into the diversity of Catholic and Orthodox Christianity. The first-time visitor to the church may be surprised to discover that it hardly stands out from its surroundings. There is no greatly decorated dome, landmark bell tower or magnificent examples of stained-glass art. The main entrance consists of one door. Other entrances were blocked off centuries ago and remain so under long-standing agreement between the three main religious groups overseeing the church: Franciscan Catholics, the Greek Orthodox and the Armenian Orthodox. The arrangement has been in place for centuries, with each group responsible for maintaining its own areas in ritualistic precision. In addition to the three main religious groups overseeing the church, the Coptic Orthodox, Ethiopian Orthodox and Syrian Orthodox also have some small responsibilities there. Finding the church is no easy task because construction over the centuries in the Old City has encroached on all sides. Except for a relatively small and indistinct plaza, finding the entrance along the maze of streets lined with shops and filled with people going about everyday life can be confusing. Once inside however, impressions change with the realization that the grandeur associated with the world’s great cathedrals is not necessary to convey that on these grounds the foundation of the Christian faith is built. The original Church of the Holy Sepulcher can be traced to 326 when Constantine ordered it to be built on the site. His workers scraped away the hillside, leaving only the rock-hewn tomb of Christ with enough room around it to build a church. As excavations began, Constantine’s mother, St. Helena, is said to have discovered a piece of the true cross nearby. The original church was much larger than the one that exists today, but had a very simple design, according to historians. What exists today has been largely built since the 12th century, when the Crusaders constructed the chapels around the Rock of Golgotha and added other features, including a bell tower, choir and transept. In 1555, Boniface of Ragusa, the leader of the Franciscans in the Holy Land, received permission to rebuild the edicule. A fire seriously damaged much of the church in 1808. Reconstruction started in 1809, and in 1868 the dome was finally rebuilt. A 1927 earthquake caused extensive damage, leading engineers to begin reinforcing the church.